Dawson Dawson-Watson (1864-1939) is the son of painter and illustrator John Dawson-Watson of London, England. The family lived in St. John's Wood, London, a fashionable residential district made up of artists, authors and actors and here Dawson Dawson-Watson spent his early life. At the age of 8, he entered the Diocesan Grammar School in Southsea, England, where he made rapid progress in his art work and at the age of fourteen, he was far ahead of his class painting live models. For a brief time Dawson Watson took up china decoration, but his association with Mark Fisher, an American artist who spent most of his life in England, turned his talents forward along the lines of painting. The two were close friends and spent many days together. Soon afterwards he moved to Paris, France and studied under Carolus-Duran, Aime Morot, Raphael Collin and Leon Glaize. He met his American wife to be, traveling with the artist Emma Richardson Cherry. Dawson-Watson then moved to Giverny, France and lived there five years, then met the American artist Carl Beckwith who urged him to move to the United States. In 1893 he moved to Hartford, Conn. and spent four years before returning to England. Soon afterwards he moved to Canada and after three years he met the American artist Birge Harrison who told him of the new Artist Colony being founded in the Catskill Mountains of New York, so he moved there. After a long period in the Northeastern States, in 1904 he accepted an offer to teach at the St. Louis School of Fine Arts, where he spent thirteen years. After resigning his position in 1917, he started making his trips to San Antonio, Texas, but it was not until 1926 that he moved there, lured by the Edgar B. Davis National Competition. 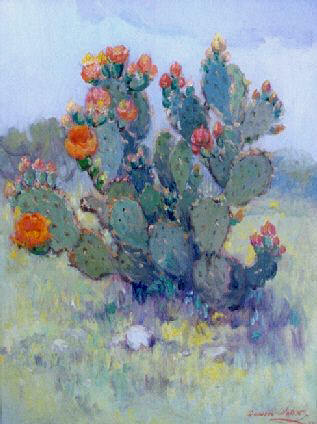 In preparation for the 1927 competition, he painted 70 cactus studies before deciding on the entry of choice. His painting titled "Glory of the Morning" won the $5,000 first prize. (Largest Prize Money in America provided by oilman Edgar B. Davis) He additionally won awards in the 1928 & 1929 Davis competition, which was the final exhibit sponsored by Davis. 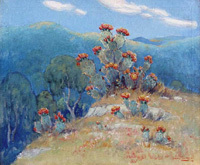 His favorite subjects during his Texas period were cactus, landscapes, coastal scenes, bluebonnets and the Grand Canyon. 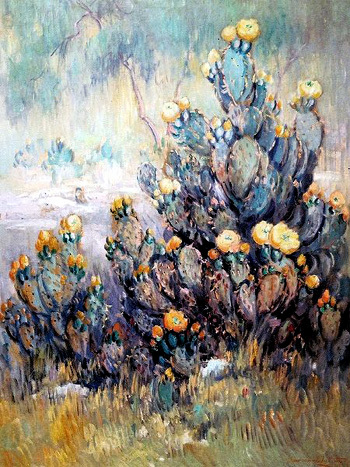 We buy and sell fine examples by this Texas Artist and have been a dealer since 1988, buying selling and specializing in Dawson Watson's works along with other important Texas Artists. Meet The Dealer. 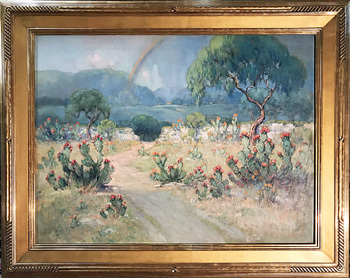 Always looking to purchase fine examples of Dawson Dawson Watson's Texas scenes. Please call or email to discuss your painting and obtaining a free and accurate evaluation & offer or acquiring art for your collection.